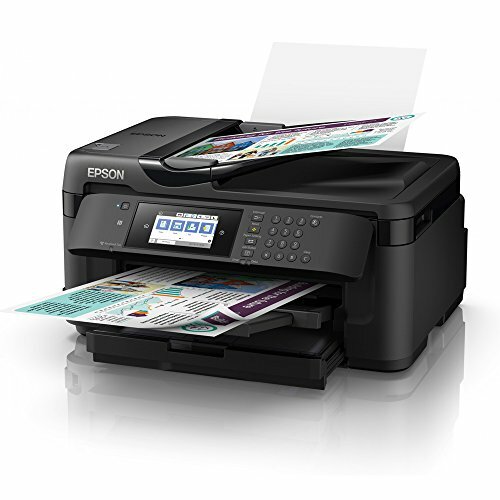 THERE WILL BE a moment, after a long day, when you’ll stop believing that Epson’s WorkForce WF-7710DWF is a big, A3-capable multifunction peripheral (MFP), and start thinking you’ve shrunk. 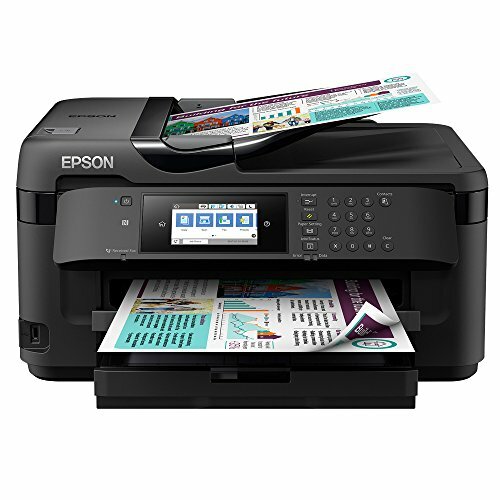 It’s exactly like a scaled up version of a regular inkjet MFP, with an A3-capable scanner, an A3+-capable printer, and a big colour touchscreen with chunky buttons. 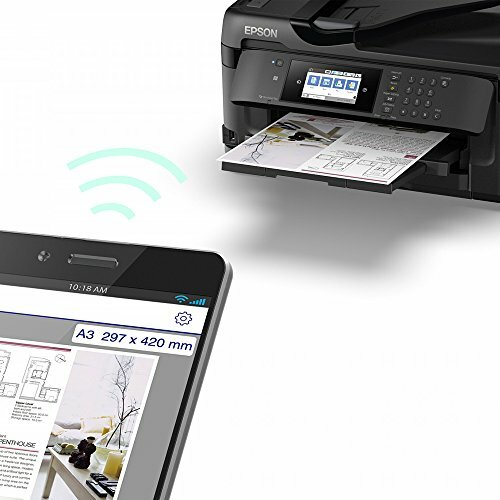 Happily, this Alice in Wonderland growth hasn’t taken out any useful features: the WF-7710DWF can connect to a wired or wireless network, and print, scan, copy and fax single or double-sided (duplex) A3 documents. 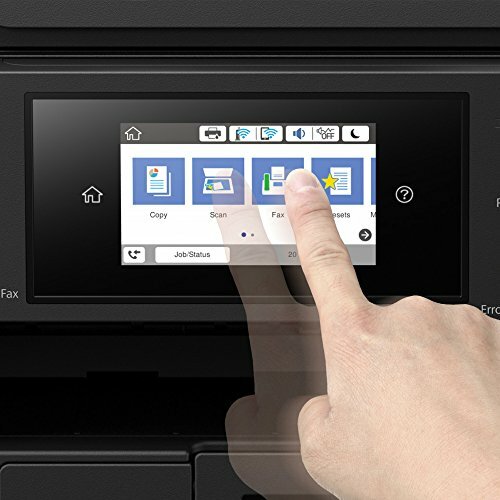 With support for the cloud and mobile devices, and a USB port for walk-up scans or prints, it’s hard to think of anything it doesn’t do, although if you need a second paper cassette you’ll have to spend another or so on the otherwise identical WorkForce WF-7720DTWF. The WF-7710DWF prints a little faster than we’d expect from a typical A4 equivalent. 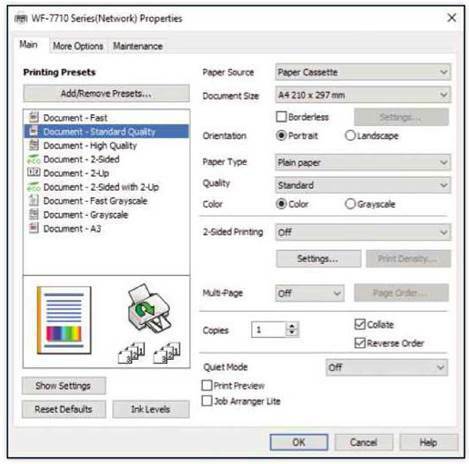 10-side colour document on to five sheets at a fair rate of 3.2 images per minute (ipm). On A3 paper, five pages of black text completed in 43 seconds, while five graphics-rich colour pages took just over two minutes. Scaled up, our duplex test completed at 2.2ipm; that may be slow, but very few other printers can even print on both sides of an A3 sheet. 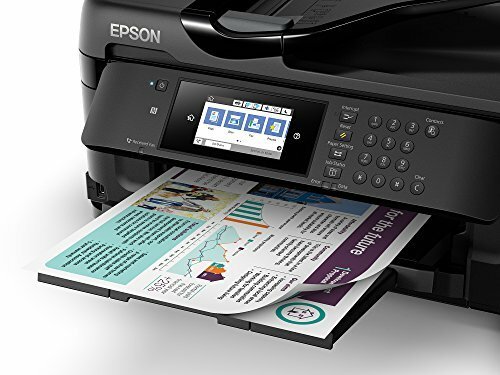 Both this MFP’s scanner and its 35-page automatic document feeder (ADF) top out at A3, not A3+, but again, the list of MFPs that can duplex-scan A3 pages is a short one. 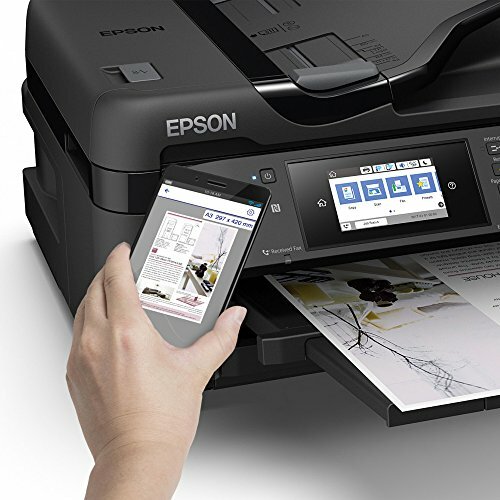 Capture speeds were reasonably fast, with a preview of a 150 dots-per-inch (dpi) A4 image completing in just eight seconds. Even a 1,200dpi 6x4in photo scan took less than a minute. A single copy took nine seconds in black or 23 seconds in colour. Using the ADF, 10-page A4 copies needed one-and-a-half and two-and-a-half minutes respectively. Very few devices can complete an automatic, double-sided copy of a double-sided A3 document: we timed 10 sides on five pages at 4m 15s. For the most part, the results were great. Scans were as good as we expect from an Epson device, with good colour accuracy and excellent dynamic range. Plain paper prints were generally good, too, with firm black text and bold colours, but duplex prints and copies were noticeably more faint; you can increase the intensity of both at the cost of slower prints. 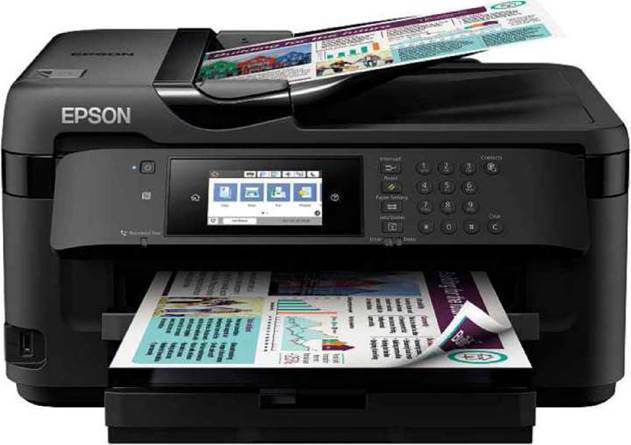 Photo prints aren’t the WF-7710DWF’s forte, however: its pigment- based inks are fine for matt media, but they can’t produce a shiny finish on gloss paper. 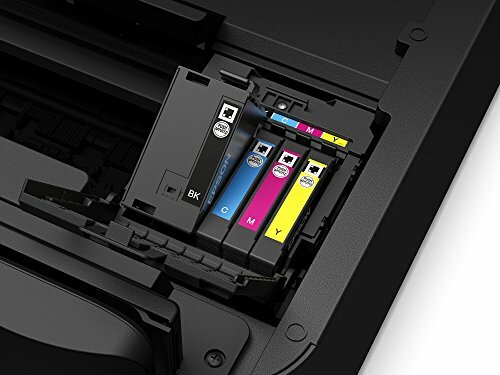 Like a large minority of printers, the WF-7710DWF began warning of low ink during our standard tests, and two cartridges went on to run out during our extra A3 testing. Replacement colour inks are available in standard or XL sizes, and there’s an XXL black cartridge. Worked out for the highest capacities, running costs are a quite reasonable 7.1p per A4 page. 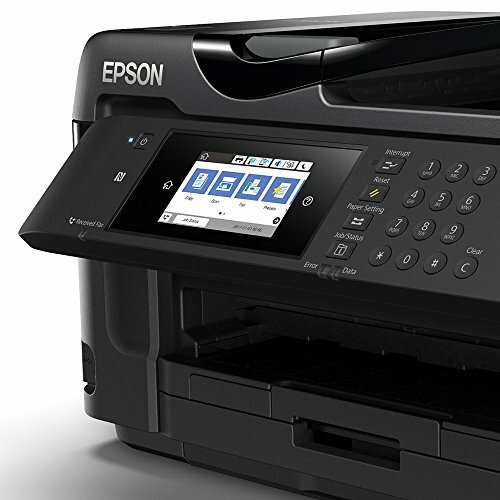 Sensibly priced, with good performance, good results, reasonable running costs and a great selection of features, the WorkForce WF-7710DWF is a great choice for a micro-office that works extensively with A3 documents.